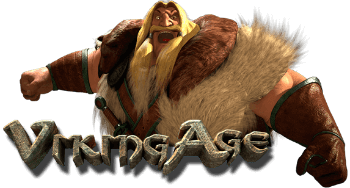 Viking Age is a slot game with 5 reels and 30 pay lines from Betsoft. The game takes you to 1000 years ago – to ancient Scandinavia when thousands of ferocious men (and women) plundered and seized new lands, expanding their territory. It is possible that with Viking Age you can join the wealth of the Vikings. By the way, you can play this slot almost from anywhere in the world. The slot is also available for Canada, so Canadians can enjoy this game in full. 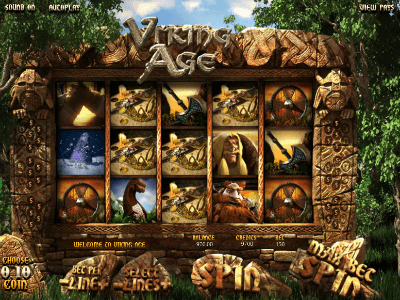 All the symbols of this game are related to the ancient Scandinavia, and the victory, like in other slots of Betsoft, is accompanied by a wonderful animation. Moreover, acquaintance with the slot begins with a colorful screensaver. To start the game, select the coin value (from 0.02 to 0.5), the bet level (from 1 to 30) and the number of coins (from 1 to 5). The total bet is the product of all three values. To get a win, you need to wait for a combination of at least three of the same characters in the line from right to left. On the side of the screen, there is a health-striking Viking girl named Amma. If you hesitate with making a decision, she will hurry you with a wiggle of pigtails. For 3 axes your bet on the line will be increased 25 times, and five leaders will bring a win in the amount of the bet on the line x1500. In the role of the scatter, there is the helmet of the Viking. For 3 of these symbols, you will get a Runestone bonus. Help Amme to choose the right symbol, and she will give you free spins, credits or a bonus round. By the way, if three Ammes appear in any part of the screen, welcome to Multiplier Free Spins! On the side of the screen, you will see stones hiding various multipliers. Any gain during free spins increases in the corresponding number of times. Finally, another bonus game is activated by three or more symbols of arm-wrestling. In it, you have to choose your Viking: Elgrim or Eric. If you manage to defeat your opponent, open your pockets wider. Although Viking Age is undeniably a beautiful game, you immediately will understand why it is not included in the number of Betsoft creations, called bestsellers: it's all about the monotony of the slot. When all the bonuses are already known, there is no sense to continue the game. It's up to you to spend a little time on Viking Age or to refer to other creations of Betsoft.